Good navigation is essential to ensure the enjoyment of everyone on the dance floor. There is plenty of space to accommodate various styles of dance if everyone follows a few rules. A fun interactive floorcraft trainer can be found at http://www.tango-dj.at/dancing/interactive/interactivecodigos.htm. 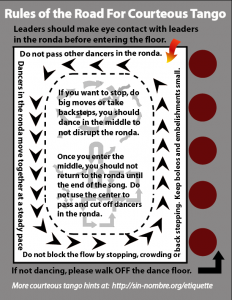 The most important thing to understand is the “ronda” or outer lanes of dancers. This functions a lot like a freeway at rush hour, everyone has to be respectful of the dancers around them in order to make everything flow smoothly. Unlike the freeway, however, we all have our radios tuned to the same station, which hopefully orchestrates the movement of the dance floor as a whole. Before entering the floor the leader should make eye contact with the leaders in the ronda. This is the equivalent of turning on your turn signal. Leaders in the ronda will return the eye contact and allow a gap for you to enter the floor. The leader can then enter the ronda and invite the follower to enter downstream of him in the line of dance, shielding her from any accidents. Leaders in the ronda, please be courteous to those entering. The ronda proceeds in a generally counterclockwise direction. Smaller milongas will have only one lane for the ronda, larger or festival milongas may have several concentric lanes of dancers. When dancing in the ronda figures should be compact and respect the line of dance and those around you. Use caution when executing boleos and other larger moves. If you wish to do larger moves, more patterns, or find that the line of dance doesn’t move enough for you, you might be happier in the center of the floor. Additionally, if you find that you are dancing with someone unpredictable or who “overfollows” you might choose to move into the center to protect your reputation. Remember, if you hit another couple, they will remember you, and you may be less likely to get a dance with that follower. Followers, be aware of the weapons strapped to your feet, any move can be toned down to avoid causing disruption or harm to the dancers around you. If your boleo hits a couple, you may find that leader is less likely to ask you to dance later. It is helpful to imagine a lane line around the ronda. Just like on the freeway, you should avoid veering too close to the line or cutting in and out. This causes the leaders to tense up and have to practice “defensive driving” severely impacting their enjoyment. Just because you didn’t hit someone doesn’t mean that they didn’t have to swerve or put on the brakes to avoid you. Everyone wants to relax and enjoy themselves, don’t ruin other people’s dance by being a floor hog. If you are dancing in the center, you should not cut into the ronda. This is the equivalent of cutting off cars on a freeway exit after the solid white line at rush hour when they are patiently going 10 mph waiting their turn. You all swear at that guy on the freeway, don’t be him on the dance floor. People who are not dancing should stay off the floor. If you need to cross the room, please walk off the floor in the corridors that are provided. If you must walk on the edge of the floor, give right of way to the dancers at all times. On NO occasion should pedestrians cut across the floor when people are dancing. If you find that you and your partner want to continue to talk when the rest of the ronda begins to move, please be courteous and step off the floor. Under no condition should teaching be conducted on the social dance floor. The majority of people come to milongas to enjoy the dance. There are plenty of opportunities for practicas and classes in San Diego for improving your tango. If both you and your partner agree that you want to work on something, Sin Nombre is lucky to have a second floor downstairs that you can use to practice. If you find yourself stopping and discussing steps or overwhelmed by the flow of traffic at the milonga, you may want to go downstairs for a bit. Dancers of all styles can coexist if they respect the rules of the road. Try to be honest with yourself what kind of dancer you are and dance in a manner that allows everyone to enjoy the floor.